Unfortunately, that is not my kitchen pictured above. Mine has at least five more crumbs on the counter and a bit more clutter. But what my kitchen does have in common with the one pictured above is the fact that it’s got a CamelBak Relay water filtration pitcher in it. My refrigerator does, at least. 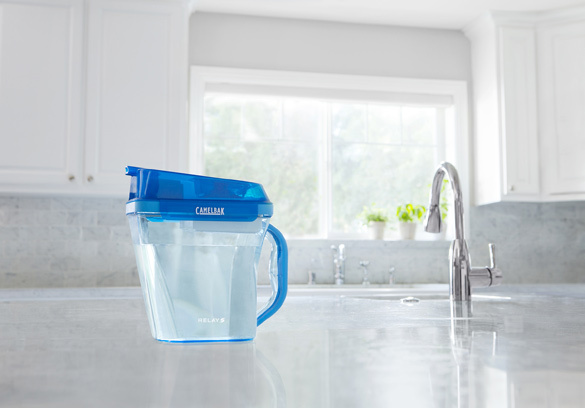 I’ve long been a fan of my CamelBak water bottle that filters water, so of course I jumped at the opportunity to try the Relay, the company’s filtration pitcher that filters water at the speed of your faucet. Amazingly, it really does keep up with the tap on full blast. You think it’s going to overflow but it never does. The pitcher is big and holds 10 cups of water, which is great in that it holds a lot of water for thirsty people. It’s a “space-saving design,” but it’s still big and takes up valuable fridge real estate. Luckily I’m able to fit in in the door, so it’s not an issue, but if space is a major concern in your fridge, be aware. The water does taste great, and now that I can stomach plain old H20 again, I’m always reaching in to fill up (works my biceps, too). 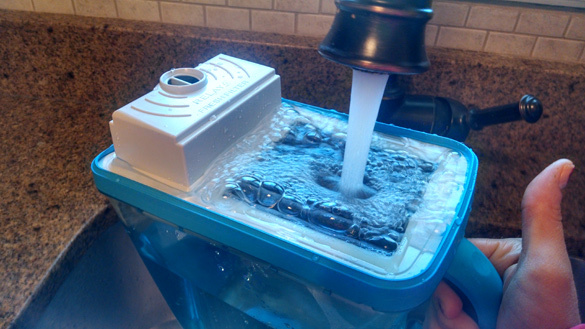 Independent tests says that the filter removes 97 percent of chlorine, taste and odor. Score! Filters last up to four months, and replacement filters run $12 a pop or $28.50 for a three-pack. Other than that, it’s extremely low maintenance. You also don’t have to worry about it spilling — there’s a seal around the edges and side-locking latches that keep the lid on tight. The pitcher is available for $36.99 and comes in aqua, clear/charcoal and purple. All are pretty!